We’re a little more than two months away from our U.K. trip. A few friends have asked me to blog about the preparation for the trip. So here’s my list of stuff to get done. Two months. ~ update wills and follow through with required witnesses, copies to kids, etc. ~ scope and sequence, make final itinerary decisions. We have 9 days in Scotland and 9 days in England. ~ buy a laptop computer?? I want to be content and thankful for all of the trip. I see two potential obstacles to contentment, although I’m sure there are dozens. One is the romantic, idyllic picture I’ve allowed to build up in my mind about Great Britain. I remember a conversation with a friend who lived in Scotland for a year. I breathlessly asked, “What was it really like?” She thought a minute and said, “Smoky. Lots of air pollution.” [whistle of bomb exploding, dreams demolished] I am hoping for moments –not two solid weeks– of beauty, pleasure, nostalgia for the life I’ve read about. Second potential obstacle is disappointment of not seeing [fill in the blank] or going [fill in the blank]. I’ve already (I think) crossed off the Highlands of Scotland. Limiting the scope is essential. One must be reasonable. A librarian I know did a 15-day trip through England, Wales, Scotland and Ireland. Ouch! I want to be content and thankful for whatever we get to see. No regrets allowed. Period. I’m considering a focus of cathedrals or ancient monasteries. Iona has captured my imagination and is on the agenda. We have extremely limited opportunities to hear pipe organs and see incredible architecture in our rural Oregon region. My husband loves wildlife so we could major in cathedrals and minor in game preserves? Dear man, he is willing to go wherever I’d like to go. He just wants to keep me safe and warm. You’ve got a lot of work ahead of you, but I agree that preparation is the key. I also like your idea of focusing on a topic, esp cathedrals. I usually head for the museums first. But I could be persuaded to visit a zoo. Would that count as wildlife per Curt’s definition? Hah! Don’t forget about special food? Noel and I sampled some special apple cobbler with cream wherever we ate in England. I remember them all being tasty, but varied. About the comfortable shoes? I recommend at least two pair because one way I combat foot fatigue is to change either mid-day or at least alternate days. Also, I would break in those walking shoes. You don’t want blisters on your first day.Ah, yes, Dana, and the first piece was the best. I seem to remember the custard getting more and more tasteless. only the *real* thing! Do you remember “chicken a la king”?Carol, if you like Indian food, you must eat it in England. It is fast becoming the national food. We found vendors on nearly every street corner. For the English/Scottish food experience, go to the pubs. Do NOT order off the menu, but go to the counter and see what is the fare for the day. Counter food is much much cheaper than the menu. And “take away” is more expensive due to the costs of disposable containers.Have you looked into English Heritage or Scottish National Trust? They are historical societies that have a membership. Then you get free entrance into their buildings. Sometimes you can buy a 2wk membership. Maybe you can do a search online and find out information. I remember that we chose English Heritage because they owned so many of the castles. Our boys were not interested in the old manor homes covered by The National Trust in England. Scotland had a different society.oh this is so exciting for you!! have fun! 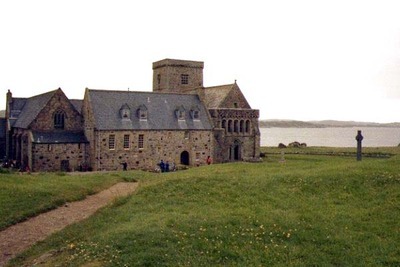 Ahh Iona, and Lindisfarne ! I have dreamed of them since reading Bede. My daughter LOVED Edinburgh, Ask one of the locals to point out their favorite pub and go there for a meal (and proceed as above!). The ladies above are so right. Great Britian has a bum rep for its food. The grass and water makes anything dairy better. So go ahead and indulge in anything that involves dairy (they allow a higher fat content.) (cream, cheese and butter OH YUM) and the meat is better as far as I am concerned. Try something that is considered a local dish as well. Also ask about the local (non tourist) used book store. You all are SO HELPFUL. Of course, used bookstores! Of Course! How did I forget that? I’m hoping I can buy shoes this weekend. Curt is going to be so surprised, pleasantly, about the food. He heard part of my list and remarked, “we ought to be eating cabbage daily to acclimate our systems to it.” We like Indian food (the two times we’ve had it) and that was one thing I was anticipating. Maxine, one book I read dittoed your thoughts about dairy. The author said that if you are ever in doubt of what to eat, go for a cheese omelet. We had better be walking A LOT every day! Your resolve to not see it all is good, you can’t and you shouldn’t try. Go with the idea that you will return. (I was planning my next visit on the plane home) So don’t feel disappointed when you do miss seeing something. You must go to Edinburgh, and since you have time in England, can you go to York? Because the Minster there is REALLY worth it and if you can arrange an Evensong there, you WILL hear fabulous pipe organ music as well as all those quintessential Anglican chorus voices. . . wow! I don’t think you will have to acclimate your systems to cabbage, unless you wish to, there are the ‘normal’ types of foods; much more and better vegetarian choices that in the States, the cultural choices of course and it’s all tremendously good! Soup seems to be the standard fare for lunch, which is great and is a comfort food for me! Afternoon Tea is essential and if you are in York, try to go to Taylors Tea Rooms, it’s in a medieval building, at 46 Stonegate. Or, I think there is a Betty’s Tea Room there as well, that’s a great place! Do you have a good travel guide book? I used the DK series for Great Britain. It has contact numbers, addresses, times/dates things are open/closed, admission prices, good maps, good directions and it’s broken conveniently into sections. The Tourist Information Office is a good resource in places as well and are usually very easy to find. They can help with just about everything and have answers to all questions! Money is easy but I found I tended to devalue it, almost treating it like Monopoly money since it is a bit different, a good quick rate of exchange in your mind is 1 Pound = 2 USD. That varies hourly sometimes! The best rates of exchange are given when you use plastic and that’s taken virtually everywhere, but have cash for tips and small purchases, and emergencies in case plastic isn’t an option, like a bus or taxi. Don’t use exchange places, you can get better rates when you convert from stores, if you plan to use travelers checks anyway. And banks are awful, charging terrible fees to cash a check! You can get good rates from an ATM, but pull larger chunks to save many service fees. Keep all your receipts and claim your VAT info at the airport when you leave, that’s easy, usually there is an envelope rack and a bin to drop it into, or a line to get on to submit it. A lot of things you buy, you can have it sent home from the store thus saving all those taxes and such. When it’s sent from the store, it’s considered to have never been on British soil so the VAT doesn’t apply! If you buy something there for someone and it stays in the UK, you can’t claim it on your VAT. They use the 24 hour clock and write dates different than us, today in the UK is 24/1/08. I know you are going to have a blast and I look forward to seeing all those lovely and well taken photos! Applechexx, we need to get together and TALK sister! We live too close for me not to pump you for information. I have loads of pictures as well, a lot are at school right now, you might be able to find them and have a browse if you like! I bet my partner in crime, I mean education, knows where they are! Alert! Today is Robert Burns’ birthday!! Plan, but don’t over–plan–leave room for impulse trips. Buy some local pasties for lunch and have a little picnic by one of the many beautiful ponds/lakes in the U.K. and soak up the smells and sounds and feel of the place! One of my other favorites is going to a local outdoor market and just listening. i carried a little notebook with me always, and wrote down the differences in words and appearances–just quick notes for later. Something to record the array of differences your senses notice. Oh, you are so going to enjoy this trip!! To clarify–the “somewhat” of a conversation with the Scottish mom was because though we both spoke the same language, we could neither one understand the other easily! It was pretty fun!